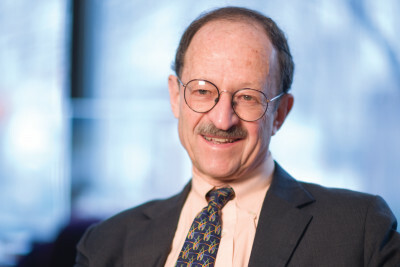 Internationally recognized for his research on retroviruses and the genetic basis of cancer, Harold Varmus served as President and CEO of Memorial Sloan Kettering Cancer Center from 2000 to 2010. Nominated by President Barack Obama as Director of the National Cancer Institute (NCI) in May 2010, he began his tenure as NCI Director in July 2010. Previously, Dr. Varmus served as Director of the National Institutes of Health from 1993 to 1999. Much of Dr. Varmus’s groundbreaking scientific work was conducted during 23 years as a faculty member at the University of California, San Francisco (UCSF), Medical School. It was at UCSF where he and J. Michael Bishop and their colleagues demonstrated the cellular origins of the oncogene of a chicken retrovirus. Their discovery led to the isolation of many cellular genes that normally control growth and development and are frequently mutated in human cancer. For this work, Drs. Bishop and Varmus shared the 1989 Nobel Prize for Physiology or Medicine. As President of Memorial Sloan Kettering Cancer Center, Dr. Varmus emphasized opportunities to harness advances in the biological sciences to improve the care of patients with cancer. Among his many accomplishments was the reorganization and enlarging of scientific programs; the construction of the Mortimer B. Zuckerman Research Center as well as new clinical facilities for pediatrics, urology, pathology, and surgery; and the establishment of new graduate training programs. A member of the National Academy of Sciences and the Institute of Medicine, Dr. Varmus is the author of more than 300 scientific papers and five books, including a memoir, The Art and Politics of Science. His honors and awards include the National Medal of Science and the Vannevar Bush Award.